Gabe’s Chemo Duck Program is committed to ensuring that all Chemo Duck products are safe for kids to use. Our products are made in compliance with all U.S. product safety guidelines as published by the Consumer Product Safety Commission (CPSC). All of our toys are independently safety tested and safety reports are available. 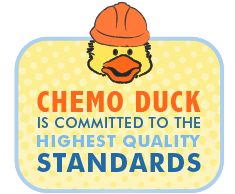 Our Chemo Duck manufacturer is focused on product safety and compliance. All products are safe for suggested ages. Products are made from all new materials, nylex fabric, no lead content, polyester stuffing, plastic bean filling, and the inks used are non-toxic. Throughout the entire manufacturing process of every single Chemo Duck, stringent safety measures are taken to ensure every child provided with huggable hope is protected from any safety issues.